I say this often enough about books. Now I really want to share this with my (former) students, girls and boys! How wonderful that so many real-life problems for young adolescents were included so cleverly by Victoria Jamieson in this book. And all in a graphic form, entertaining while giving the main character Astrid a strong, strong voice. There are varied themes, yet friendship is the strongest one, and honesty in friendship is something all of us need to learn. If you haven't read it, you'll need to in order to see how Astrid learned quite a bit as she became Asteroid, a real Roller Girl. A new 2016 alphabet book! Discovered at my library, a brand new wordless alphabet book, beautiful for looking and seeing all the ways each letter page shows something that begins with that letter. When I read about this on Kim Krans' site, she first published the pages in black and white in 2011, but now they're gathered into a book, black and white with a watercolor wash on some parts. All of the pages have easy-to-find items for early readers, and some objects seem a little more challenging. For example, the "L" page includes the letter L filled with "lace", and a "lamb" "leaning" on the bottom part of the L. There is also a "lion" "lying down", and "leaves" on branches in various places on the page. See how cleverly the author/artist sneaks in the letters! One more thing! The L sits on a "line". This would be a fun art mentor text for a class creating individual pages or a personal alphabet book. If you need help, the things included are listed at the back. You can find Kim Krans' site at The Wild Unknown to take a peek at her lovely art. I've gathered and read several books about bears. Some you may know, but all were new to me. It was fun seeing the different looks at the bears in each book. The art on each page is exquisite. Hannah says she starts with a piece of black paper and cuts away until she has the essential shapes and lines for each object. With what looks like the basic background of black, Hannah Viano adds some color to each page. It's a beautiful introduction to wonders of nature, including "K is for Kids", another creature that belongs outdoors. There are Jackrabbits, Otters, Nests and Clouds. What a fun book. You can find Hannah's art here. Otto, a little bear in a book, loves when children read about him, but his secret is that when all is quiet, he comes to life and goes exploring "out" of the book. Unfortunately, his family moves, and takes his book with them. Otto is left behind, and happy bear that he is, goes exploring. The world is a big place for this little bear, and there is a nice surprise for him when he discovers the library, and many other friends who sneak out at night. In black outlining and watercolor, Katie Cleminson's illustrations show the adventures of Otto beautifully. For all ages Dumont's illustrations show well the challenges of being homeless. In this story told by a bear, we hear the problems: puzzled by being without a home; lots of food available, but no money to buy it; staying out late to scavenge in garbage cans, so sleeps most of the day; other people stay away, afraid. One little girl sees through to the real bear, and acknowledges him bringing a bit of happiness. This allegory can be used more than once for discussions of the stereotypes of the homeless. Bear and Bunny, two great friends, have fun in the forest. They wander, they look at things, they nap together. One day Bunny suggests that they need a pet, and there comes the next adventure. For young children, soft and sweet illustrations show the forest in the search, and the surprise when they find their pet. Lots of chuckles upon the finding happen, too. This can be a good introduction to a year round look at bear habits. Told in rhyme, a bear wakes up from the long winter's sleep (about a hundred days), and begins the springtime fun, all with her two cubs (who stay for two winters). I enjoyed the rhyming which will call out for questions as the book is read aloud, for young children. "Skinny bears/With winter hungaries/Gooble food/to fill up tummies." The wonderful paintings show the bears and other animals in the forest all through the year. There is some extra information at the back in an author's note. And I won't forget Catherine Rayner's The Bear Who Shared, Dennis Haseley's A Story for Bear, Thyra Heder's The Bear Report and the non-fiction Jeannie Brett's Wild About Bears. AND-one other favorite mentioned by commenters: The Bear Ate Your Sandwich - Julie Sarcone-Roach. Next: Quiet for my book club, & I just got All American Boys by Jason Reynolds & Brendan Kiely-- will start soon. Nice assortment of bear books. Some are familiar and some are new. They are giving me ideas of stories I can share with my kindergarten students. Here's what last week was like for me. Happy reading! Hope you'll be able to find the ones you like the sound of, Kathy. Thanks! There really are some great bear books! So glad you enjoyed Roller Girl. I love it - love the addition of musicals in it! I read Roller Girl Saturday, then again on Sunday. Yes, I loved it, Michele. Thank you! Sounds like a great collection of bear books. I have not yet read Roller Girl. I've only heard great things about it and I'm sure many of my students would love it, too. As I began gathering, I was amazed at the different approaches all the bear books had, and I admit I do love them! Enjoy Roller Girl when you get to it! Thanks, Lisa. I bought two copies of Roller Girl before it won a Major Award. My students like it, and it's sort of like vitamin fortified sugary cereal-- better for them than it could be! Funny analogy, and it may be a sneaky way to show them what's possible in a variety of ways of living. Glad to hear that your students like it, Karen. Thanks. And I would too, Jane. The ones I reviewed are newly read; the ones I mentioned at the end are ones I own. The Bear Ate Your Sandwich is wonderful too. Perhaps I should keep a long list! Thank you. Roller Girl is an unbelievable graphic novel. It is a book kids will love and filled with important messages. Your collection of bear books are fun - We agree with Jane. The Bear Ate Your Sandwich is a great addition to this collection. Glad you enjoyed the bears, and I will add The Bear Ate Your Sandwich-agreed it should be there! Thanks. I love Roller Girl! It's also very popular with my students. 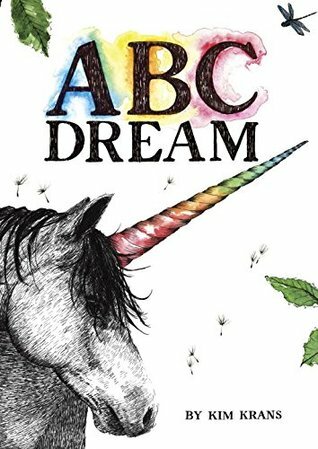 I requested ABC Dream from my library & I'm looking forward to reading it. Hope you have an awesome week! Thanks, Jana, It seems like your library stays up to date too. Hope you enjoy the book. Roller Girl has been on my list for awhile - excited to read it. It was great! Hope you like it, too. Hi Linda- Happy Monday. Thanks for bringing Roller Girl to my attention--looks great. I'll share your bear books with some of my first grade teachers who love bears. They'll really appreciate it. Have a great week. Hi Melanie, Happy Monday to you, too! As you read, Roller Girl pleased me so much, would love to see other middle grade & older enjoy it, too. So glad you'll share the wonderful bear books! Thanks! 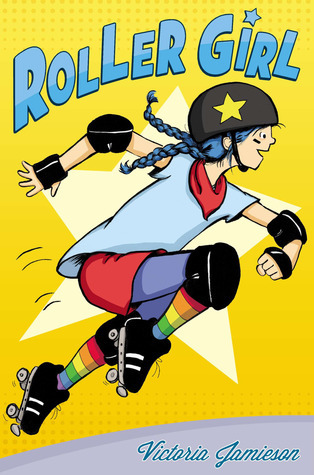 Roller Girl is definitely on my list--especially now that it has been honored! I don't own a copy, so I haven't gotten to it yet, but I will have to head to the library! Thanks for sharing! I'm glad I finally read it, Ricki. It is well done, and realistic and fun. It is a wonderful book, found him at my library (ha!) & brought him home for a while. Enjoy! Yay Roller Girl! It is such a fun book! 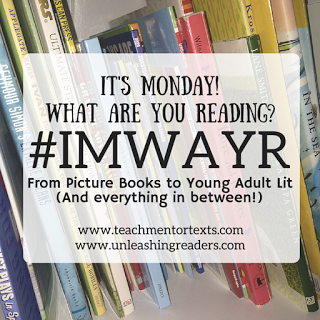 I love your theme for today--some great books listed here. Thanks, Kellee. All of a sudden I found that I had all these bear books, owned & from the library, partly because of the grandchildren, and partly because they're favorites of mine too. Roller Girl is such a fabulous book! It is still really popular in my library with both boys and girls! Love all these bear books! Thanks, Cheriee, glad to hear about Roller Girl where you are. I do want to read Roller Girl! It sounds fabulous. That is quite a collection of bear books, too. Thanks, Kay. I hope you find Roller Girl soon! We were going to have the author of ABC Dreams in our store but maybe it's been rescheduled. It looked fun from what I've seen of it. Its quite lovely, Earl. I know it will be fun for younger children, and beautiful for a mentor text. I hope you'll get to meet her! Thanks, Myra, I Am A Bear is one I wish I could read to a group of older students, wondering how they might respond. It is beautifully written. Putting all the bear books together was fun. Hey, Linda! I agree with you about Roller Girl-- it's got a lot of good in it, and I'm glad it got some Newbery recognition! I'm just a tiny bit jealous that you're reading All American Boys. I really want to get my hands on that one, but I have so many to catch up on that are written for my students' ages. That one is definitely on my list, but may have to wait a little longer. Enjoy your reading! Thank you. I am now reading all ages, so I do have that benefit of retirement. I still am not very "up" on middle grade books, still gravitate toward YA. Glad you too enjoyed Roller Girl, great book.